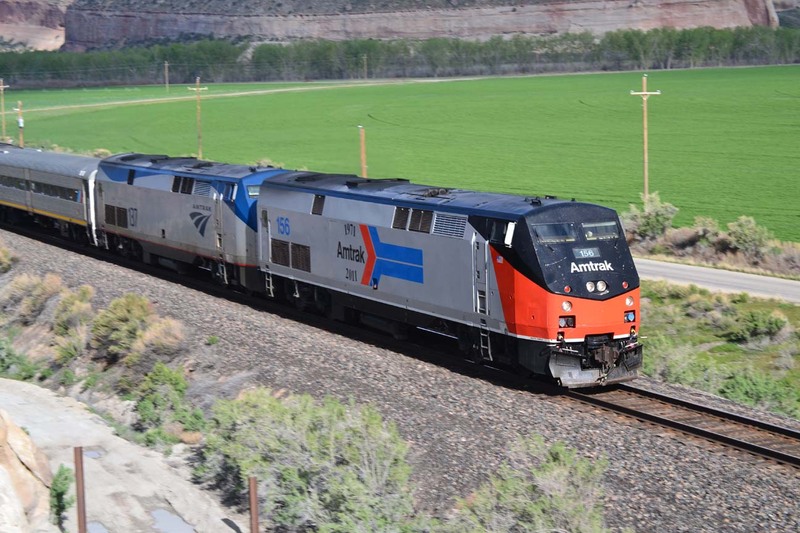 Amtrak has rostered a fairly small array of locomotive models on its western long-haul trains, if we discount the mixed fleet acquired at its initial creation. SDP40F’s, F40PH’s, B32-8’s, P40’s and P42’s account for nearly all of them. By the time I started photographing trains the SDP40F’s were gone and the few P30CH’s were relegated to places I never went, but I have managed to capture examples of all the rest. 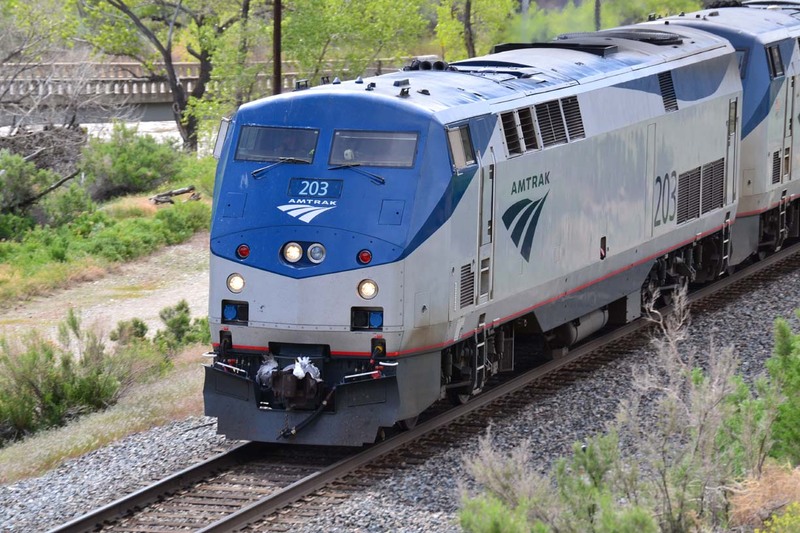 All of these examples are from the west, mostly on the California Zephyr, the Southwest Chief, and a few on the Ski Train or the Winter Park Express. Paint schemes have changed over time. 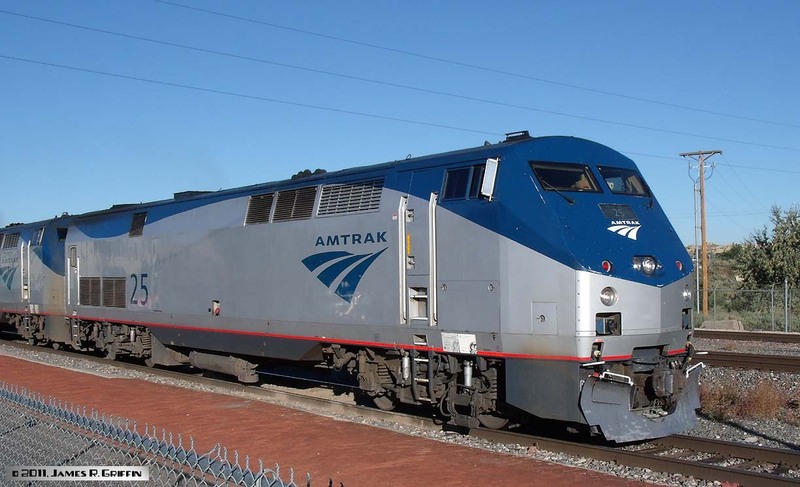 See the top Amtrak page for more on that subject. Photos are arranged more-or-less chronologically, but you can use the table of links below to jump directly to a specific unit. 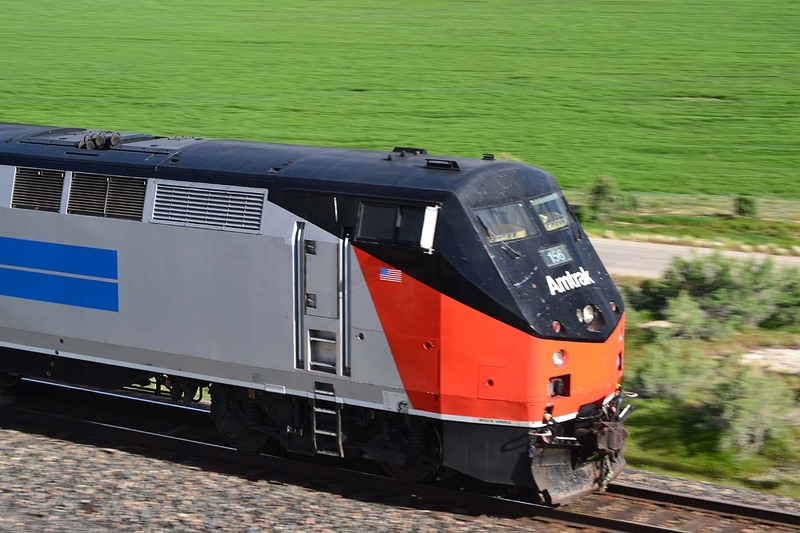 The F40PH is basically a cowled version of the GP40-2, with an added Head-End Power (HEP) generator. 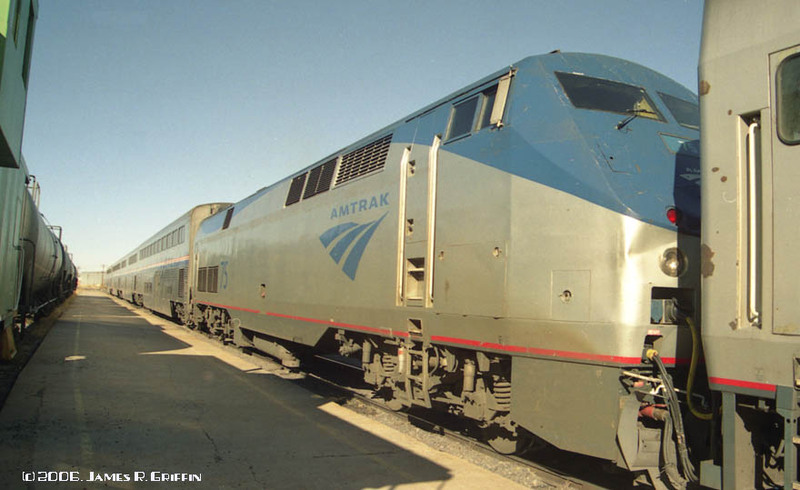 These 3000-HP units began arriving in the late 1970s, and served Amtrak well for over 20 years. Arriving in three groups, they were numbered (by group) in the ranges 200 to 229, 230 to 328, and 329 to 400. The first group had smaller 1,500-gallon fuel tanks; the latter two groups had the larger 1,800-gallon version. Nearly all F40PHs have now been retired or sold to other operations, so there is no real numbering conflict with the higher series of P42s. 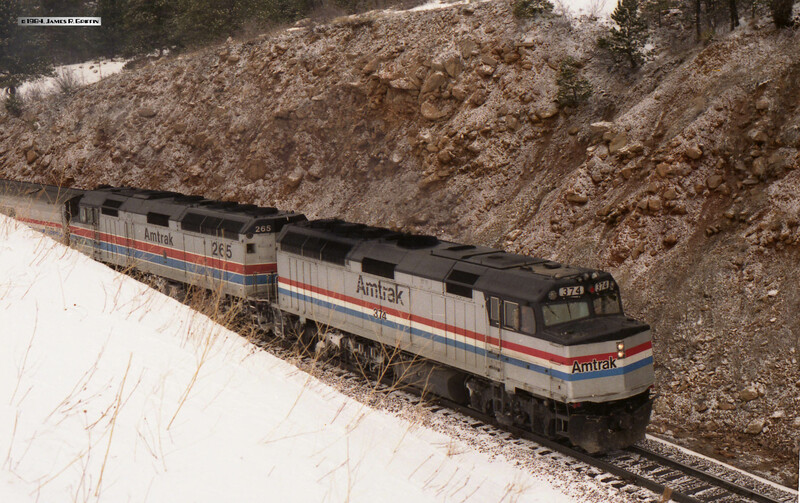 In March 1984, Amtrak F40PH locomotives Nos. 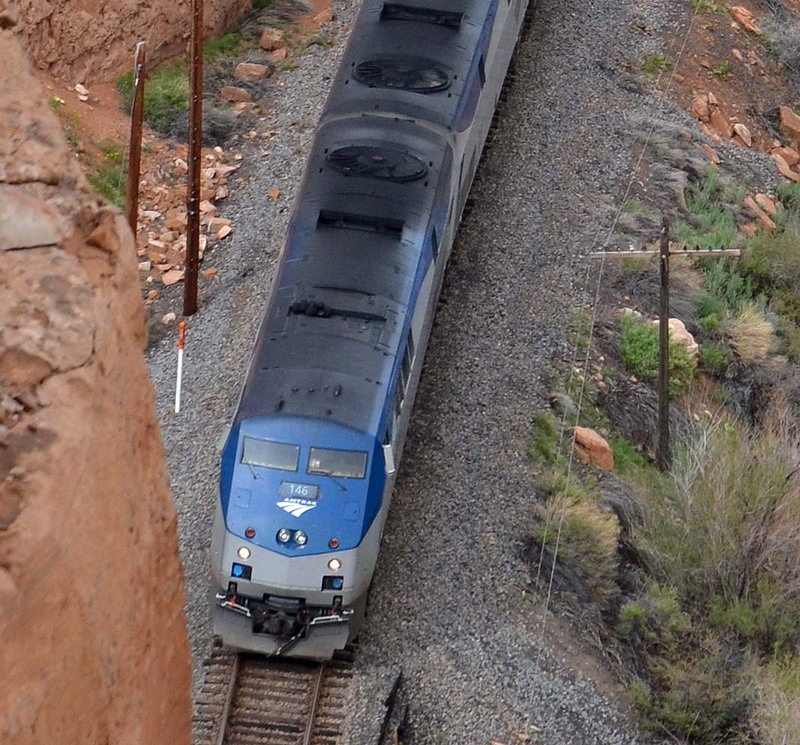 374 and 265 are leading the California Zephyr westbound near tunnel 1, above the Highway 72 bridge just west of Denver. No. 374 is in the relatively-new Phase III paint scheme, whereas No. 265 is still in Phase II. July 1986 has Nos. 358 and 316 on the point of train No. 6, a half-mile east of the photo above. No. 287 leads No. 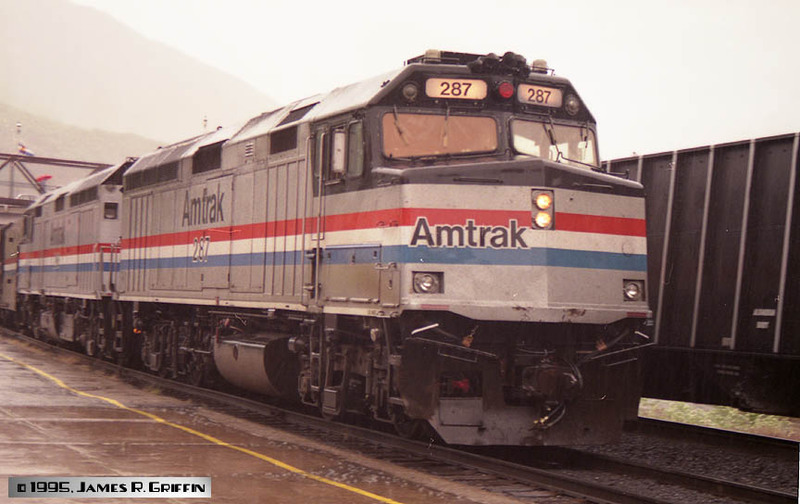 6 on June 30, 1995 at Glenwood Springs, CO. By now there often were AMD103s on the route, and the days of the F40s were numbered. Nos. 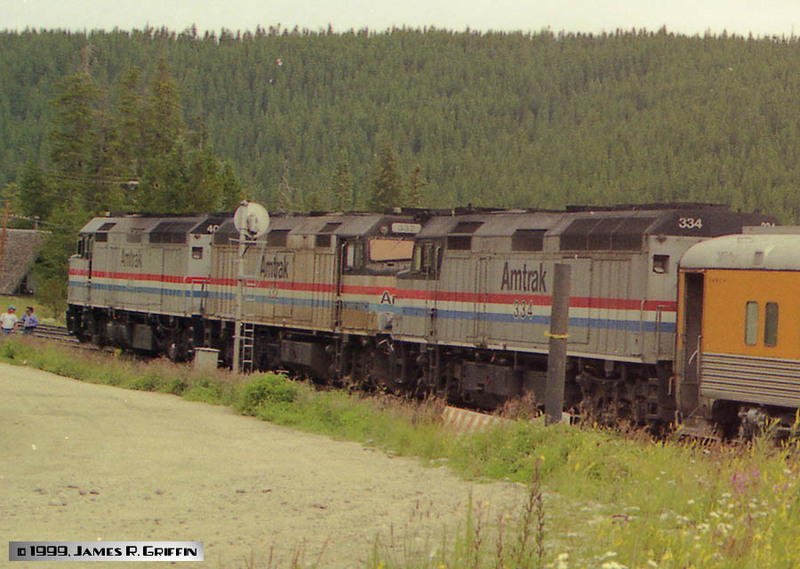 388 and 298 are leased to Ansco to power the Ski Train for the 1997/1998 season. 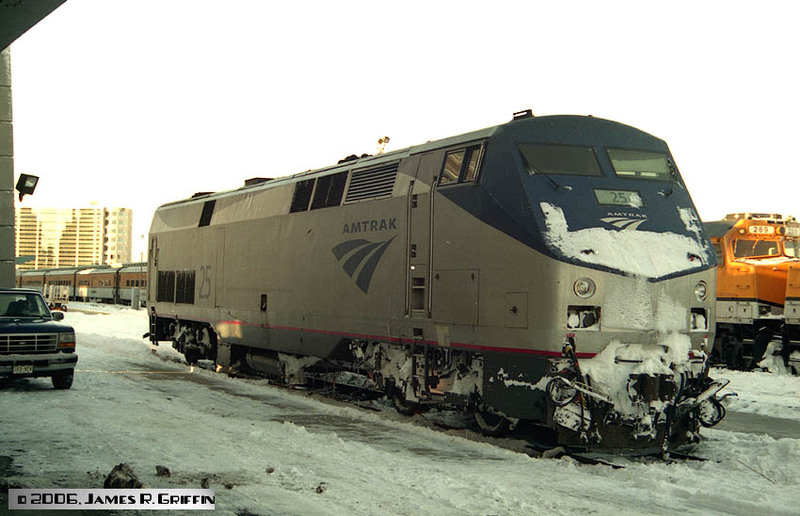 Here they’re grinding up through Plainview on January 2, 1998. 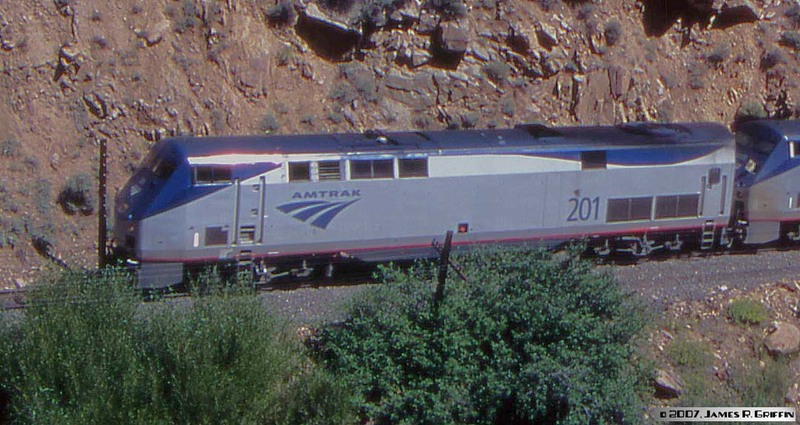 A common arrangement for two seasons, it turned out that to have only two units on the long train– one running HEP as well as traction power– was to operate right on the margin of reliability. Eventually, the operation began using three F40’s. 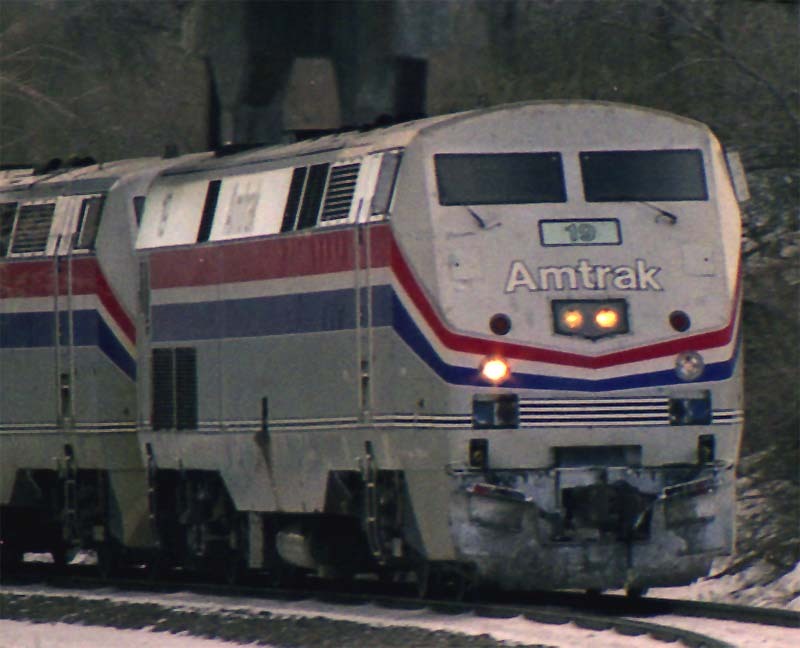 Bottom: the prior week (December 28, 1997) the same power leads the train through Crescent siding. Nos. 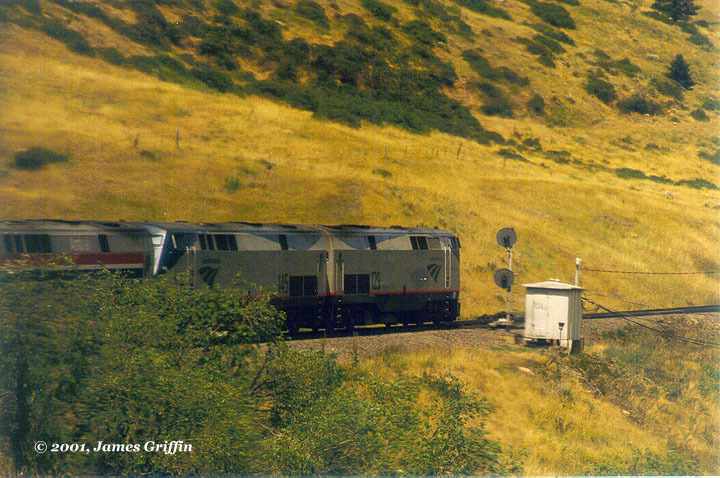 334, 332, and 40-(something) are being leased by Ansco to power the Ski Train in August 1999. 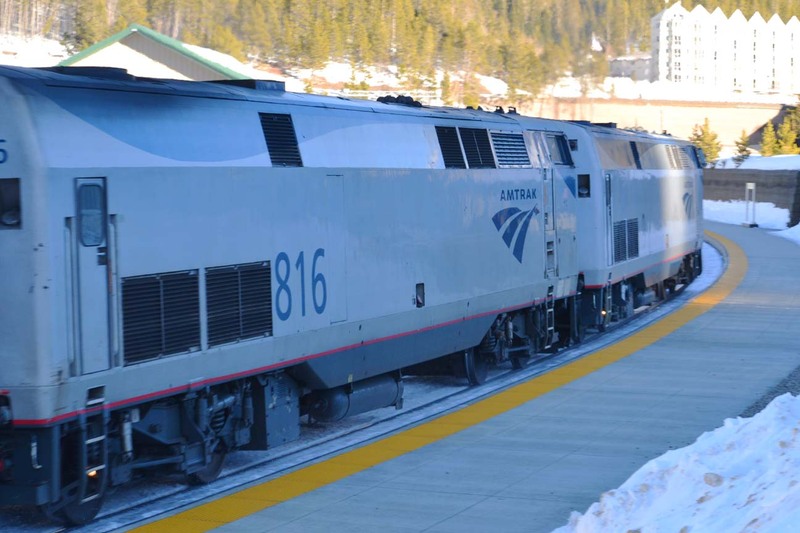 Here the trio is at Winter Park, CO, waiting while the train unloads passengers. Afterwards, they will take the train to Tabernash to be turned, and bring it back for loading later in the day. 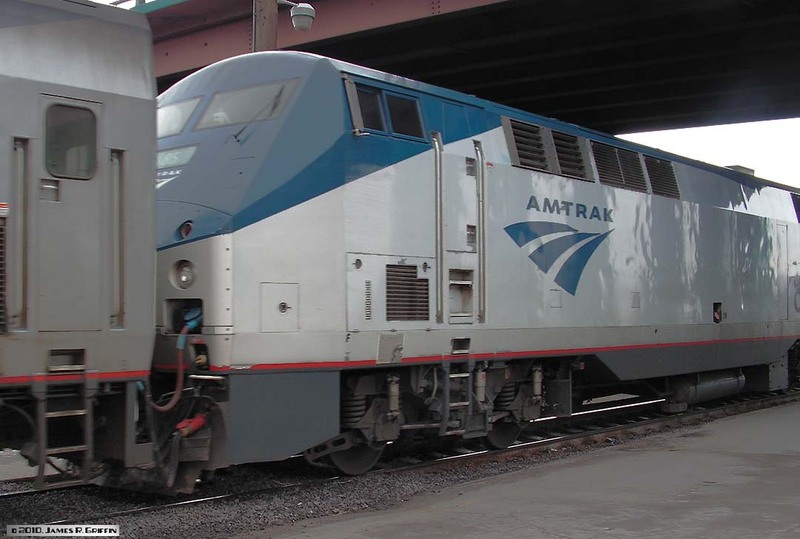 By this time, very few F40PH’s were left in Amtrak service. 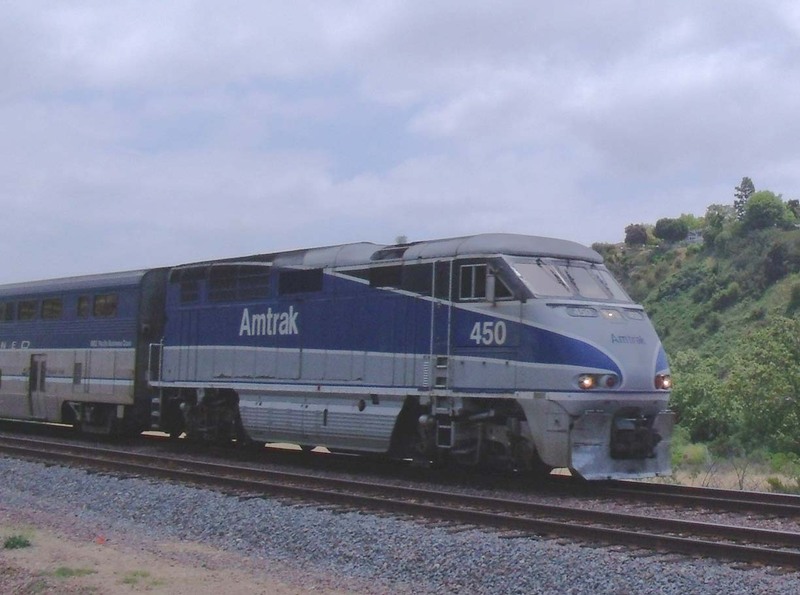 For more views of F40 locomotives continuing in service for other railroads, see here and here. To my knowledge I only saw one of these, ever. 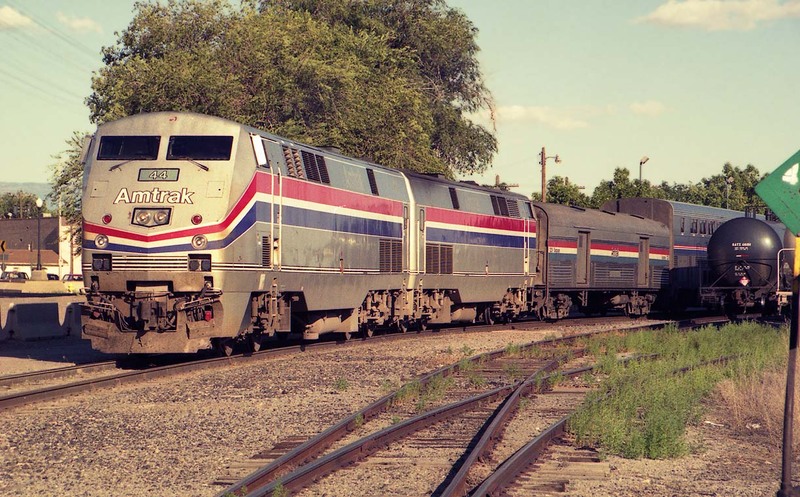 They wore a unique paint scheme (dubbed the “Pepsi Can” by railfans). I only caught the unit on analog video; here is a screen capture of No. 503. Here No. 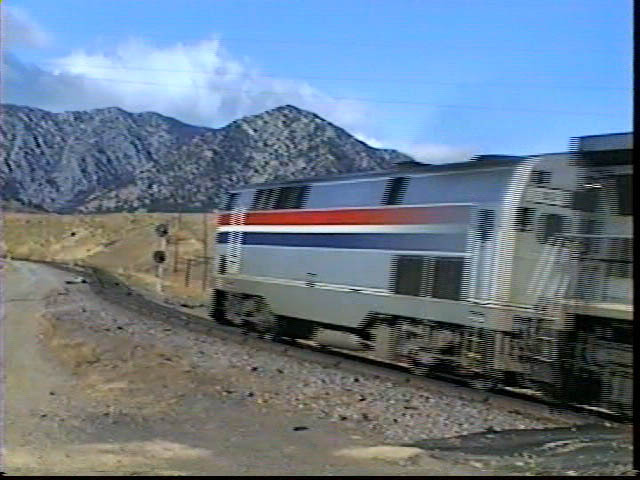 503 is the trailing unit on the westbound California Zephyr at Rocky. This scene was on January 4, 1997.
online, but since circa 2013 some have been reactivated. Two P40s, Nos. 822 and 812, head up No. 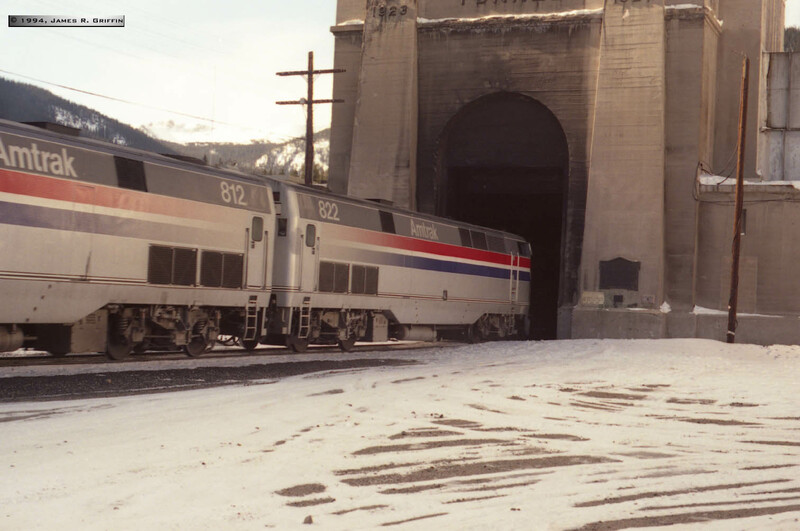 5 at East Portal, CO on November 25, 1994. They wear the first Genesis paint scheme, where the stripes fade out toward the back of the unit. This was supposed to be reminiscent of a ribbon flapping in the breeze. The scheme did not long endure, probably because it was hard to maintain. 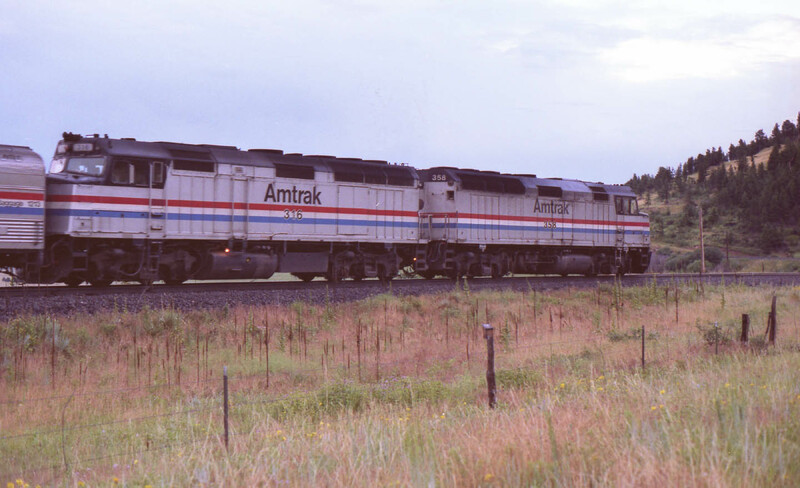 Both of these units were repainted circa 1999-2000 in the Phase IV scheme, a la No. 16 below. we have a closer look at the back end of the two units. This scheme was only applied to the P40 series. No. 805 is captured on video at east Rocky on 1/04/1997. No. 816 has been repainted into Phase 5 and resuscitated for regular service again. nearly identical to P40s on the outside (minus a rear hostler window), but have an additional 250 horsepower. They are numbered in the series 1 to 207. After the advent of the P42s, the P40s appeared only rarely on western trains. Up-close detail photos of P42 Nos. 75 and 201: click here. A pair of P42s led by No. 44 (No. 62 is trailing) have train No. 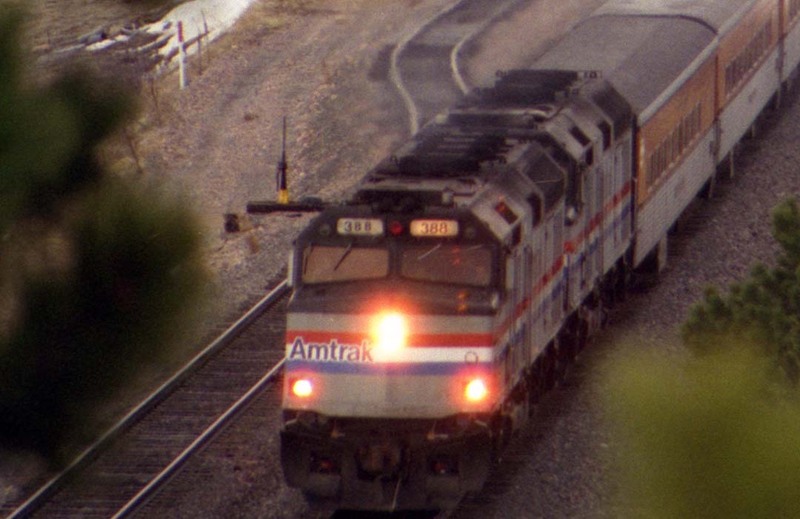 5 at Grand Junction, 8/01/1998. 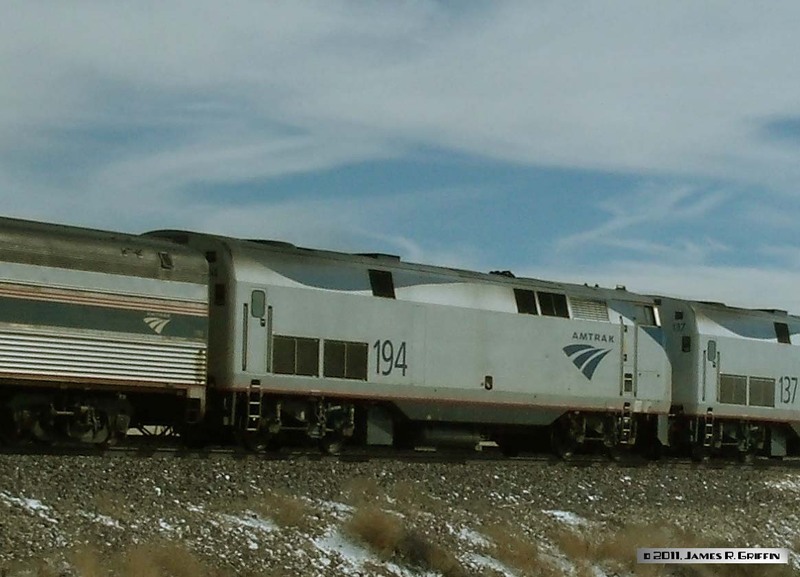 Notice that the Genesis Phase III stripes do not line up with the stripes on the baggage car (or any other cars). Here’s the opposite side of No. 44, as the train pulls out of the station. You can see the stripes well. The angle of the photo doesn’t show the large number very well, just small numbers on the cab doors. P42 No. 19 is on No. 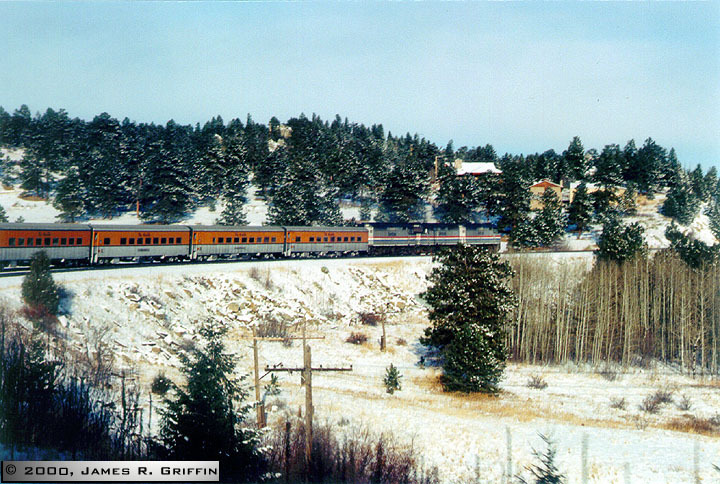 5 at Rocky Flats, CO on 12/26/1998. It wears the second Genesis scheme– solid stripes all the way to the back doors. This simplified design is basically a modified Phase III look, adjusted to deal with the nose contours on Genesis units. About two years later it received the Phase IV scheme, and towards the end of 2003 was put in Phase V colors. P42 No. 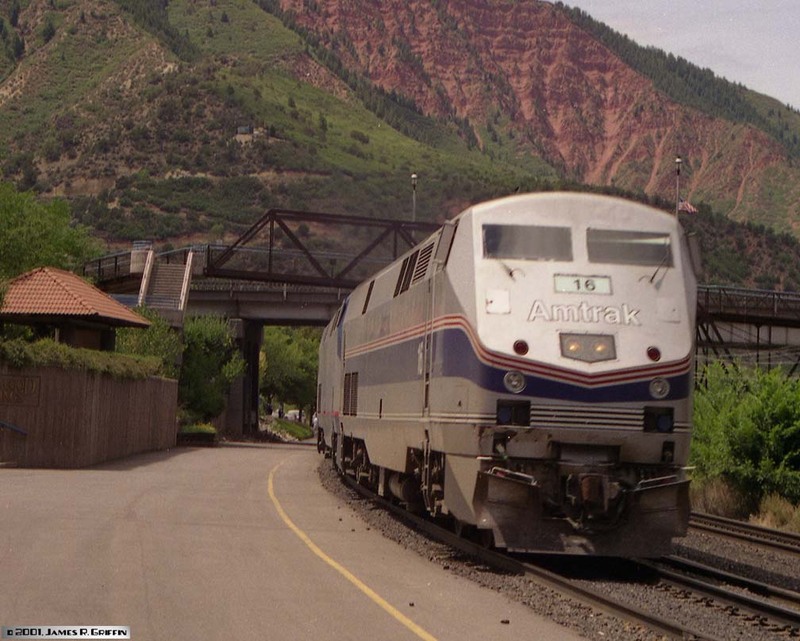 16 has the eastbound CZ at Glenwood Springs on August 7, 2001. 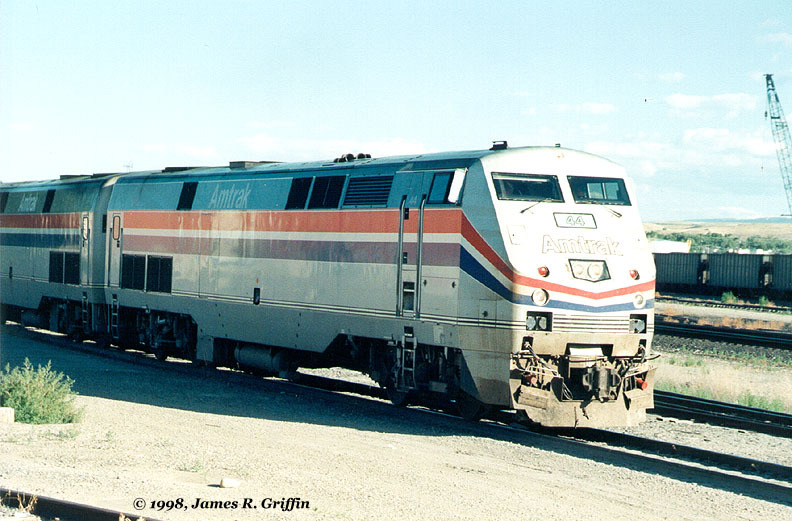 It’s in the Phase IV Intercity scheme, not as commonly seen in the West as the other schemes, even though it matched the current Superliner Phase IV look. This unit was repainted in Phase V in Spring 2003. Three P42s, including Nos. 129 and 145, lead train No. 5 at Clay (west of Denver) on 8/5/01. They are in the Phase V paint scheme. The third unit is still in the modified Genesis phase 3 scheme (without the dots). Yes, this view was shot from aboard the train. Note: In 2011, No. 145 was designated as the Heritage Unit for the Phase 3 scheme and repainted. Bottom: No. 129 trails on train No. 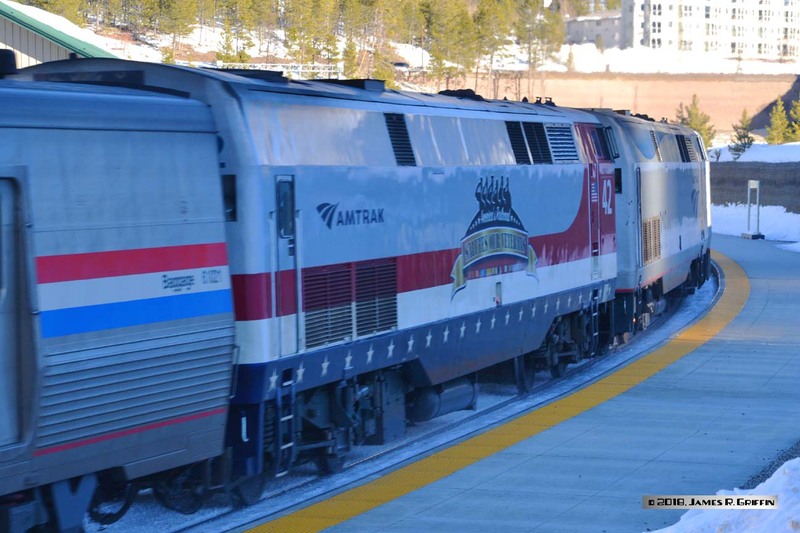 5 past Utah Junction (Denver, North yard) on December 16, 2014. Now it wears a conventional phase 5 scheme. P42 No. 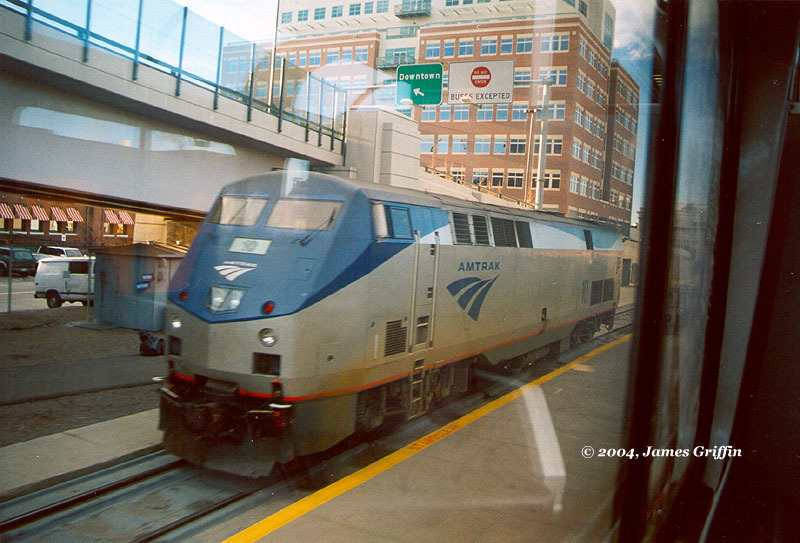 10 is on the team track at Denver Union Station on New Years Day, 2004. It’s seen from the lounge car of Train No. 5 as it departs the station. No. 10 wears the revised Phase V scheme with the lowered skirt stripes. P42 No. 155 is on the point of Amtrak No. 5 on New Years Day 2004 at Glenwood Springs. She wears the original version of Phase V. Note that the red sill stripe is slightly higher, with a blue pinstripe below, and dark gray below that. 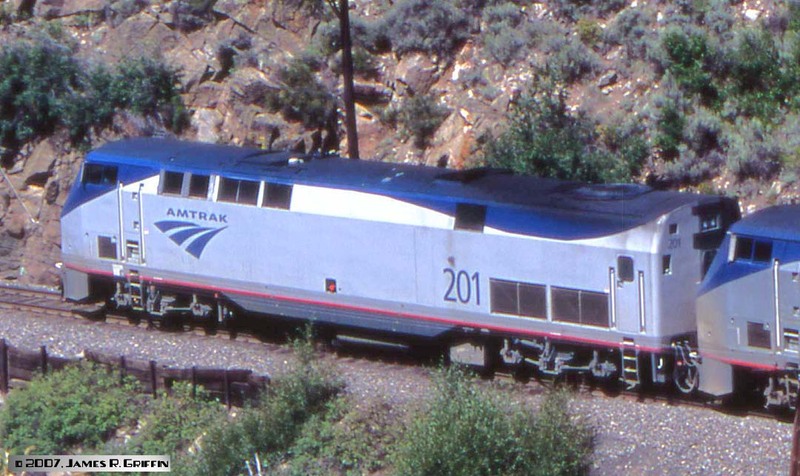 There’s also a small Amtrak logo below the cab windows. P42 No. 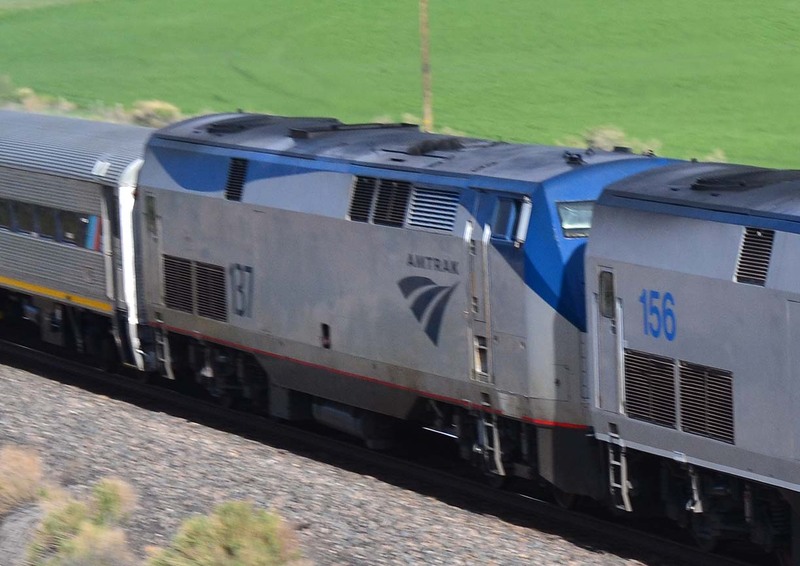 65 is the trailing unit on Amtrak No. 5 on New Years Day 2004 at Glenwood Springs. She’s in the modified Phase V scheme. Top: No. 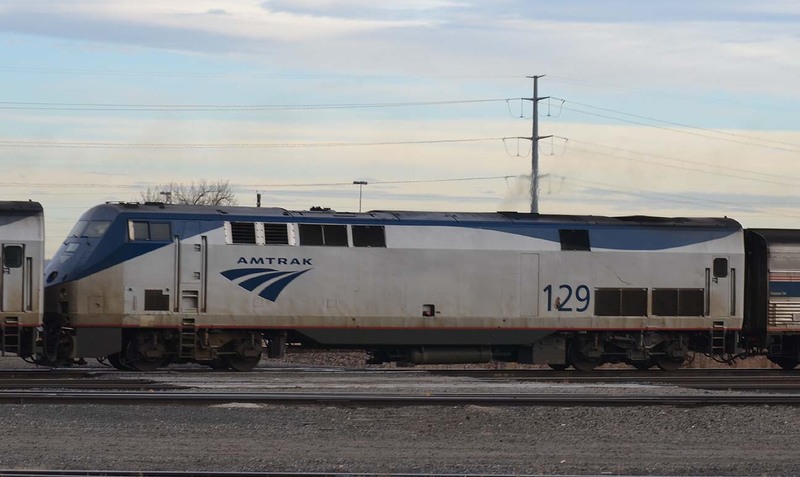 25 sits in at Denver Union Station on 12/31/2006. 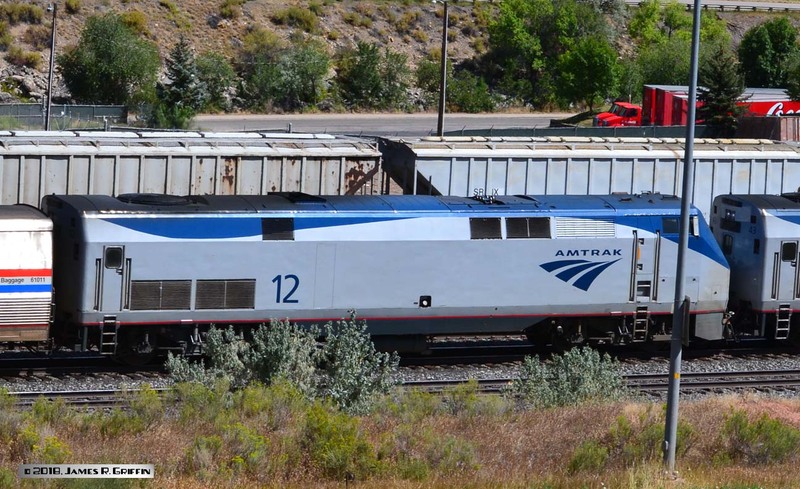 Amtrak has been keeping a spare unit here to protect the California Zephyrs. At the time of the photo, Denver was buried under its second blizzard in a week. The Ski Train in the background had been annulled the previous two days due to conditions on the UP.Bottom: Here’s No. 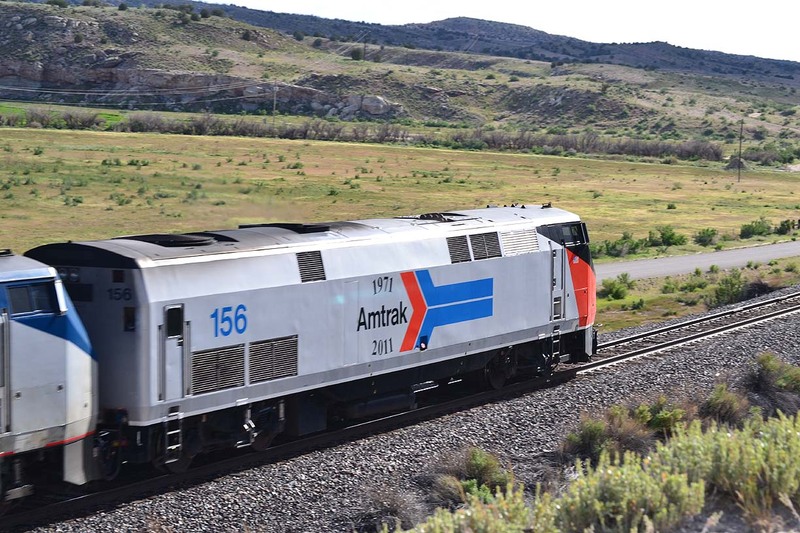 25 again, this time in warmer climes on the eastbound Southwest Chief at Gallup station, 9/24/2011. No. 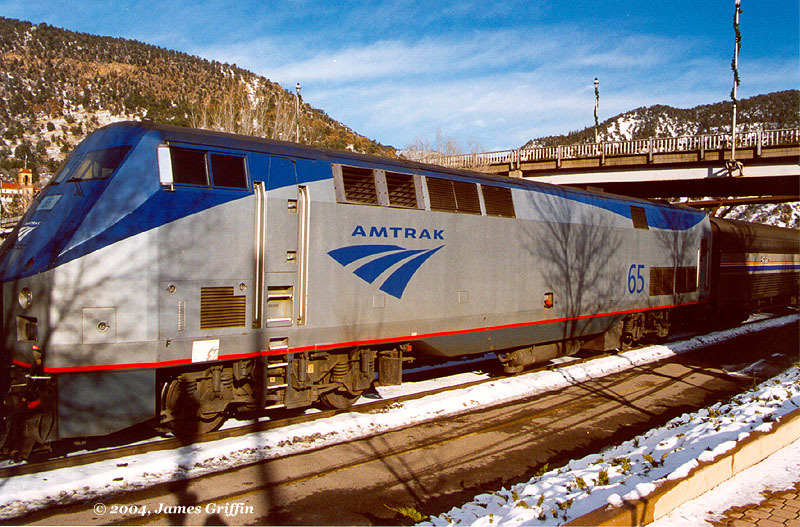 75 is running second on the eastbound California Zephyr at Grand Junction, CO on 1/05/2006. 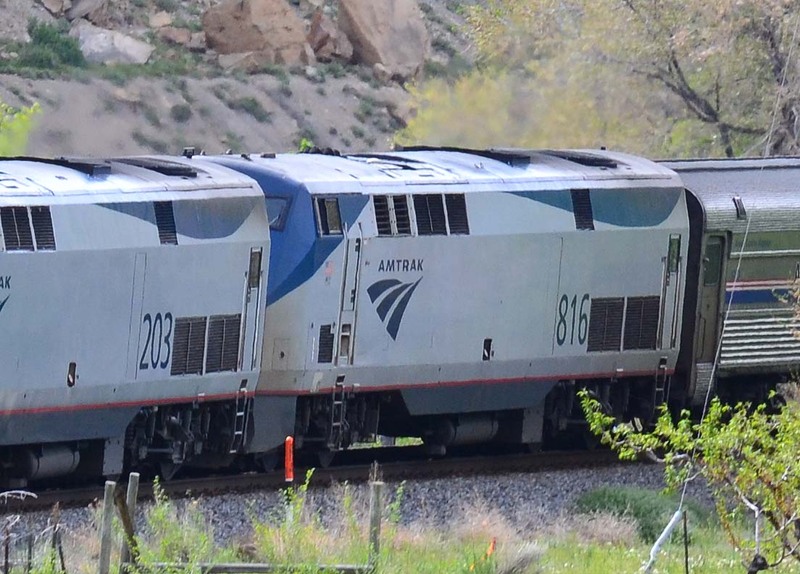 On this day the train was being run as a stub operation west of Denver, terminating at Grand Junction, and as such was run without sleepers, baggage car, or lounge. This locomotive has obviously run into something– probably a grade crossing accident– giving her a nasty crease across the nose. There is no builder’s placard on this side, probably lost during multiple repaintings (or wreck damage?). TOP: No. 201 is on the point, same train as No. 75 above. through Byers Canyon on August 9, 2007. The alignment of US 40 on the opposite side of the canyon allows for good viewing in most cases, except for the code lines which were still in place at this time. No. 18 trails on train No. 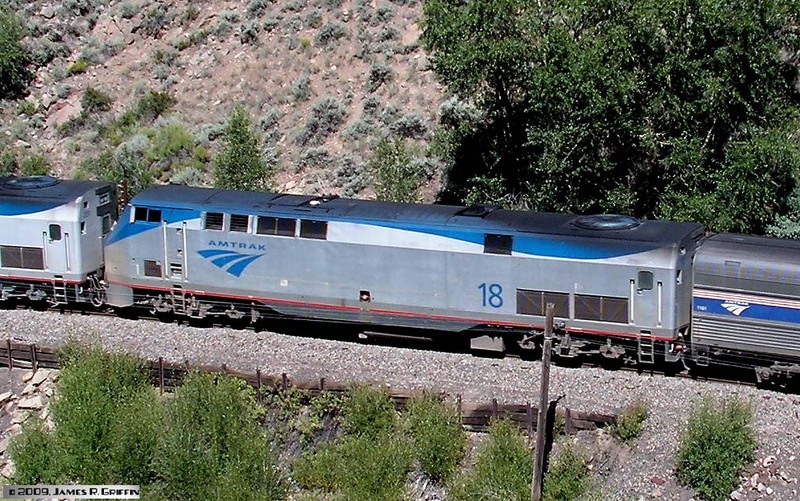 5 on 8/09/2007 in Byers Canyon, CO. A decent overhead shot which shows an interesting weathering feature: since Amtrak usually runs elephant-style, the exhaust grime sweeps almost exclusively to the rear of the unit. No. 59 leads train No. 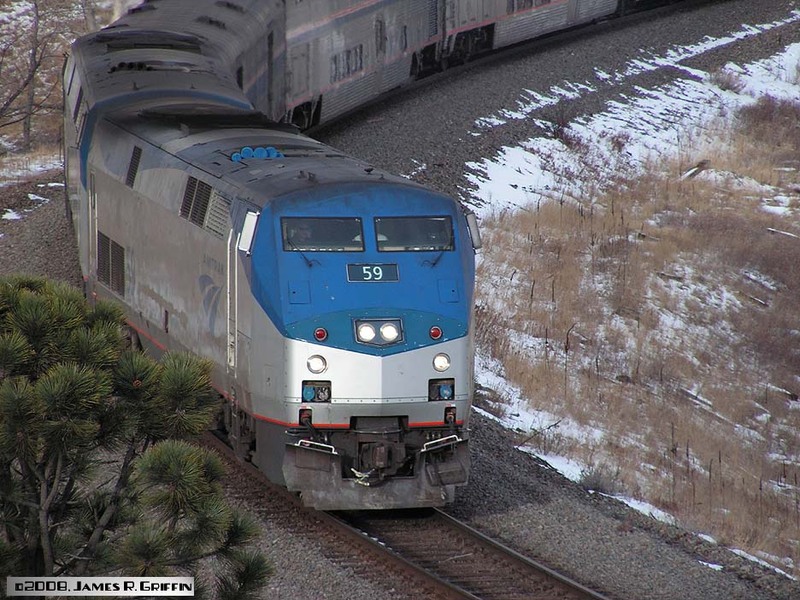 5, the westbound California Zephyr, on 12/6/2008. Photo taken at the base of the Big 10 curves west of Denver. This shot clearly shows the two different shades of blue that have been used on these units– the panel around the headlights has the grayer version. Side profile of No. 197 as it trails on train No. 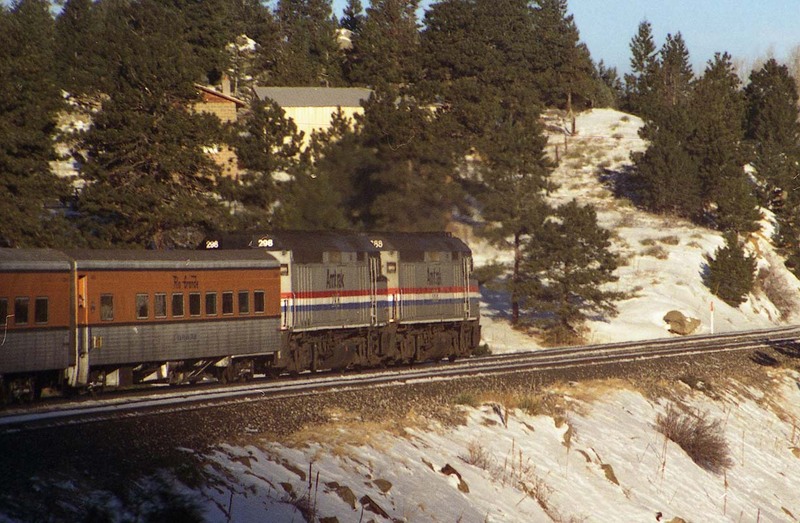 5, the westbound California Zephyr, on 12/6/2008. 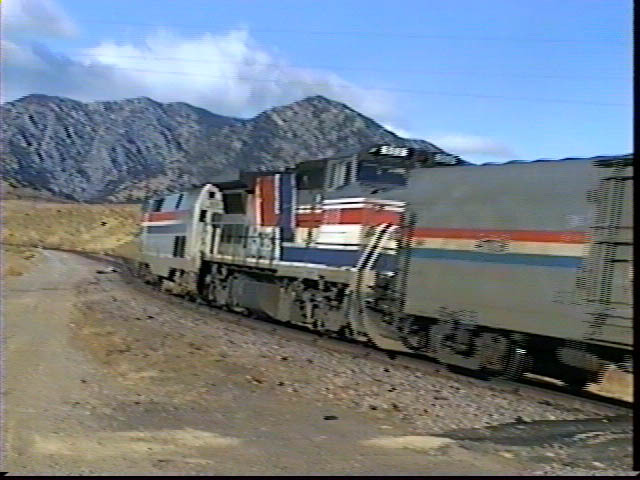 The train is passing the east signals of Clay siding, about 20 rail miles west of Denver. No. 186 leads train No. 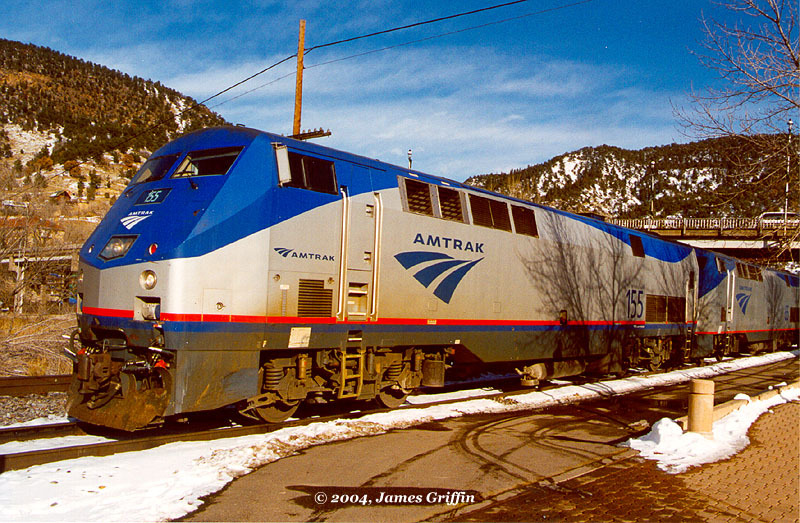 4, the eastbound Southwest Chief, at Albuquerque on 2/26/2009. Typical Phase 5B unit. The conductor was quite a character, sporting an Aussie-style hat and full white beard. No. 88 is the trailing unit on train No. 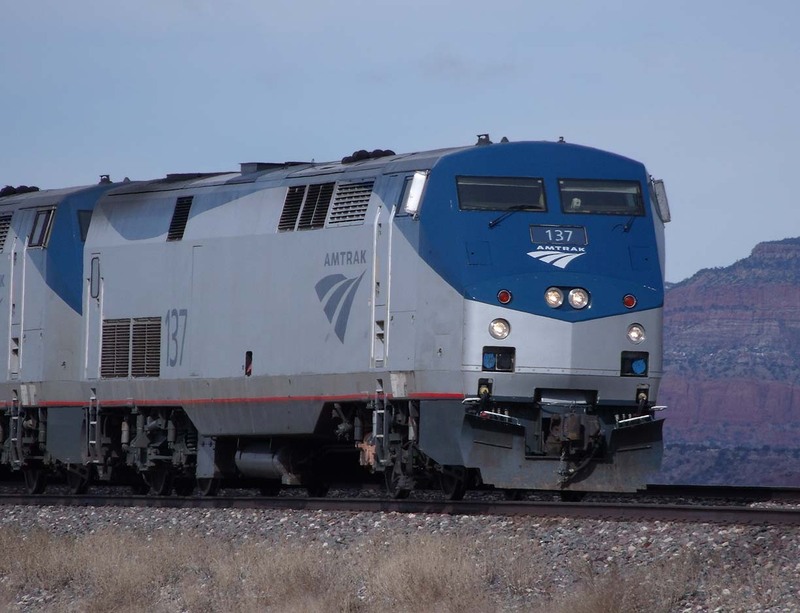 4, the eastbound Southwest Chief, seen at Albuquerque on 2/26/2009. Typical Phase 5B unit. No. 123 with 113, in Seattle on 7/24/2009. Picture is a little fuzzy– we were on a moving tour bus at the time. 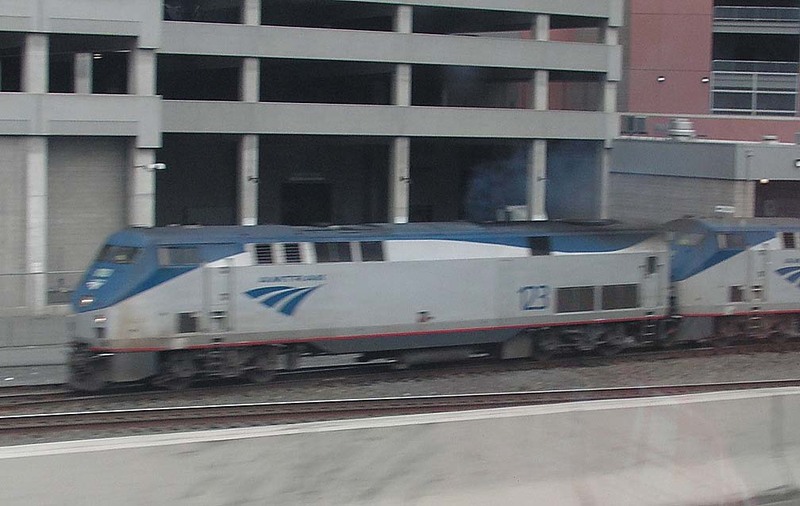 Not sure what train this is, but it includes a Pacific Parlour car, which probably makes it the Coast Starlight. Top: Here it is on the point of No. 4 at Albuquerque on 2/07/2010. The power have just been fueled and are pulling forward to the passenger platform at the depot. Bottom: Opposite side, on No. 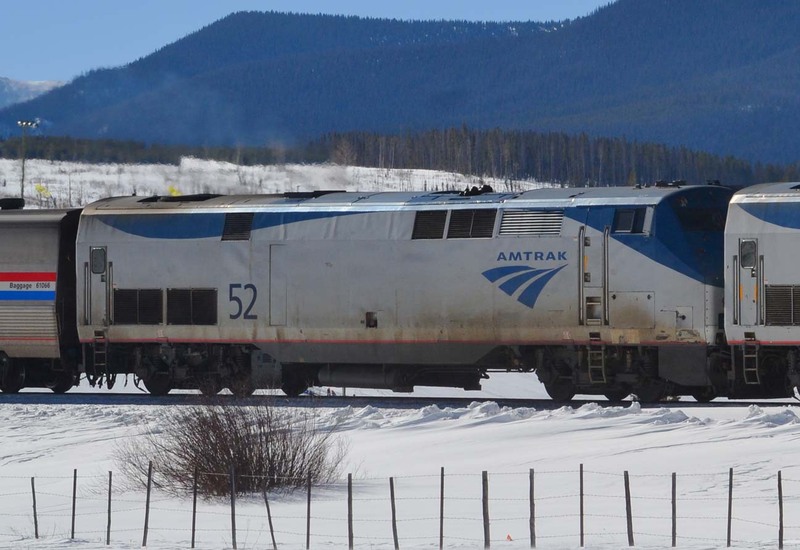 5 at Fraser, Colorado (2/18/2018). No. 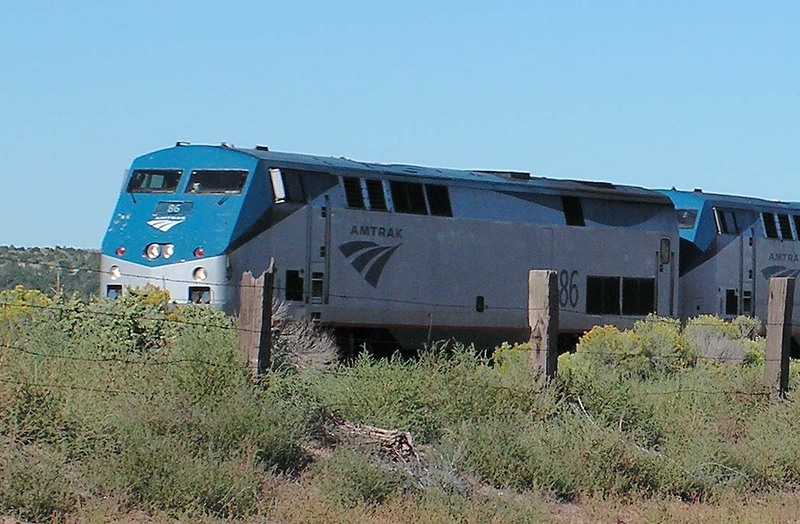 86 is on the eastbound Southwest Chief at Perea (east of Gallup, NM) on 9/11/2010. The hurtling train left me no time to get a better vantage point than this. No. 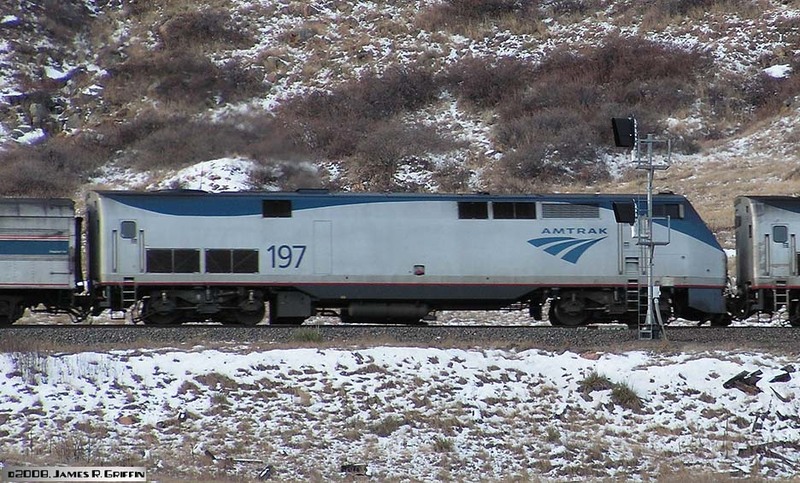 194 is trailing unit on the eastbound Southwest Chief at Prewitt, NM, 2/21/2011. No. 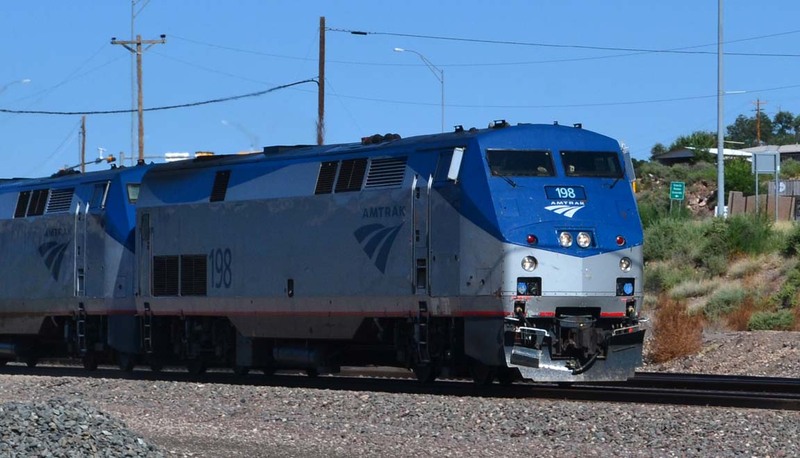 50 on the eastbound Southwest Chief at Gallup station, 9/24/2011. Heritage Unit No. 156, three views at Westwater, Utah. 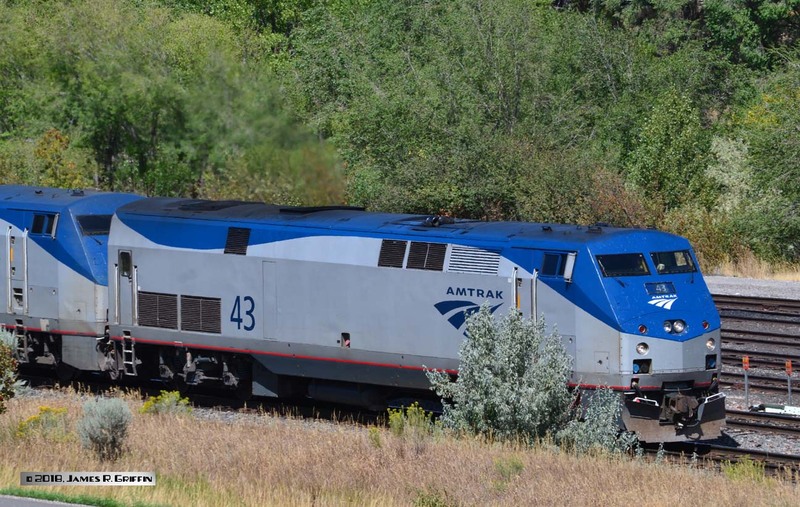 This unit completely deserves a full roll-by…in 2011, Amtrak decided to commemorate its 40th anniversary by repainting one locomotive after each of its historical paint schemes. No. 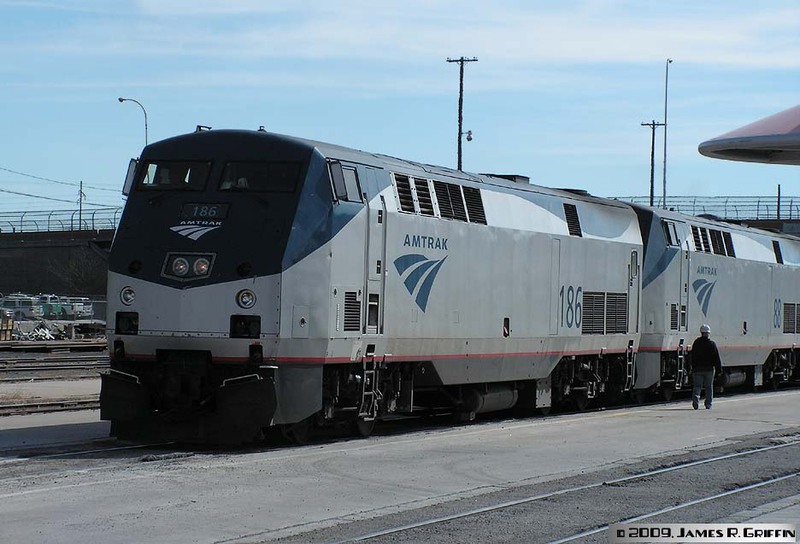 156 sports an adaptation of the first scheme used after Amtrak’s creation. 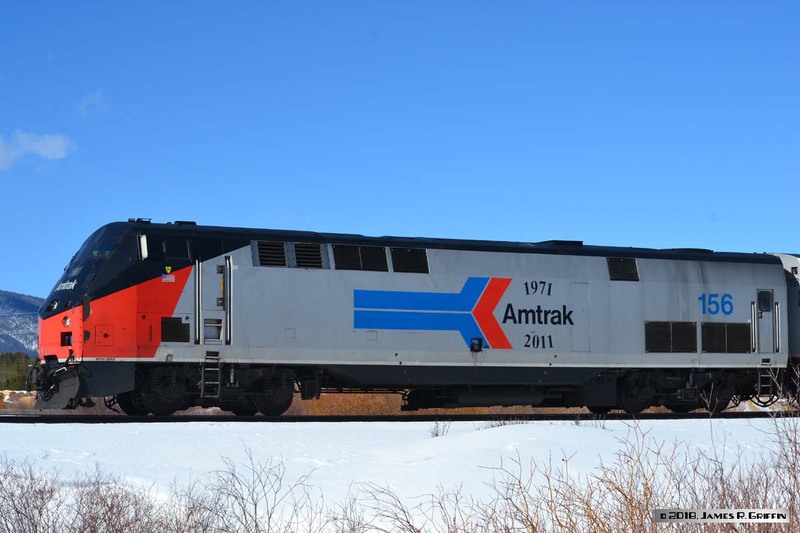 The heritage units are extremely popular among railfans, and this one is arguably the most popular of them. It’s definitely my personal favorite, although the Phase 2 unit is a close second. Bottom: Opposite side, at Fraser, Colorado on 2/18/2018. The 156 was assigned to the Winter Park Express for most of the 2018 season, much to my delight when we rode the train. No. 168 heads train No. 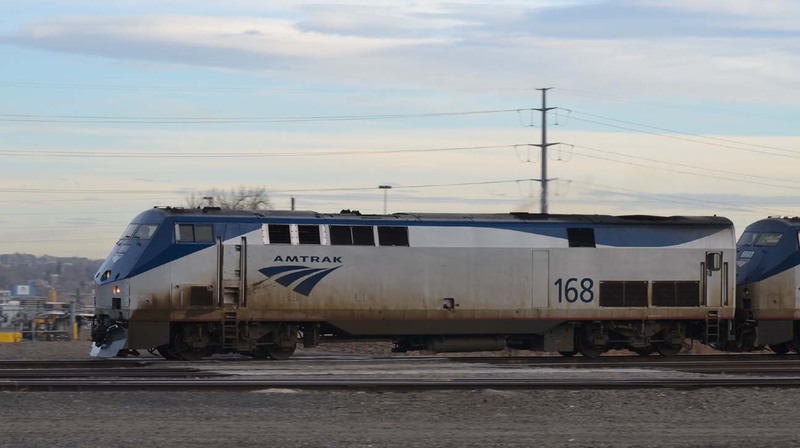 5 past Utah Junction (Denver, North yard) on the gray morning of December 16, 2014. No. 198 leads the eastbound Chief at Grants on 8/29/2015. This was one of those moments when the gates come down just as you park the car, and here comes the train! Lucky I got any photos at all. Engine engine number 9… Leading No. 6 around the curve leading into the Moffat Tunnel on 2/18/2018. No. 52, trailing unit on No. 5 at Fraser (2/18/2018). No. 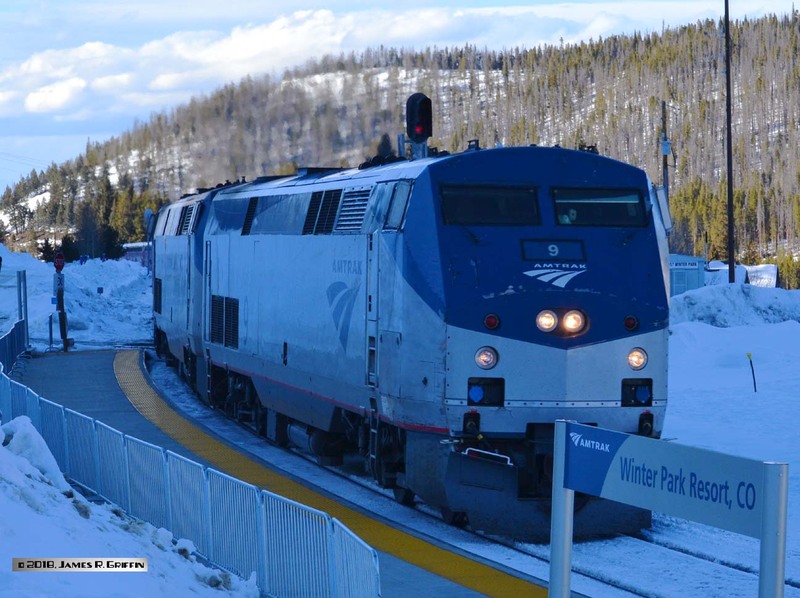 42, the Amtrak Veterans Salute unit, rolls past the Winter Park ski area and into Moffat Tunnel on 2/18/2018. No. 43, leading No. 6 into Glenwood Springs on 9/01/2018. No. 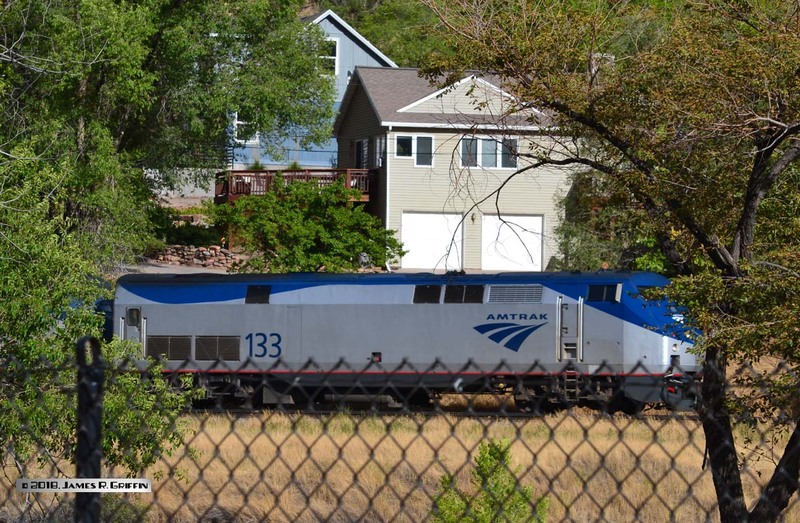 12, trailing unit on train 6 rolling through the yard at Glenwood Springs on 9/01/2018. No. 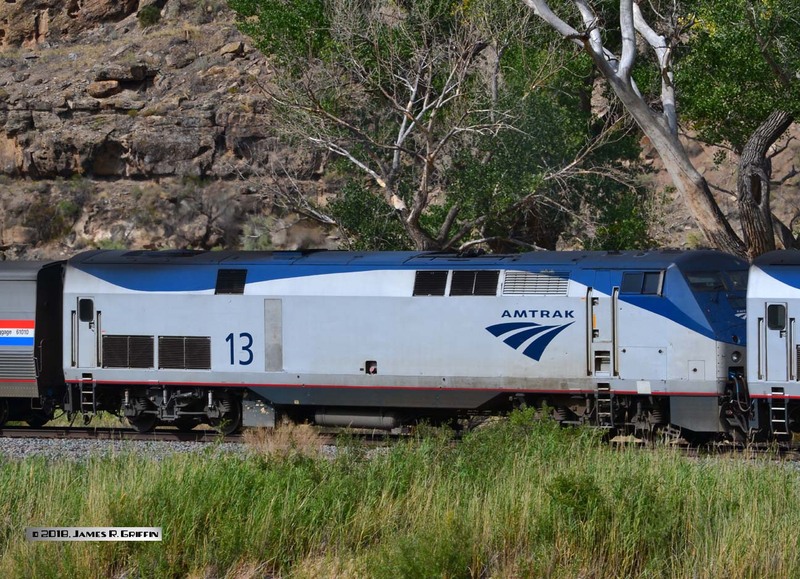 133 leads westbound train 5 out of Glenwood Canyon on 9/01/2018. This was the best shot I could manage, unfortunately. P40 No. 816 was the trailing unit that day. No. 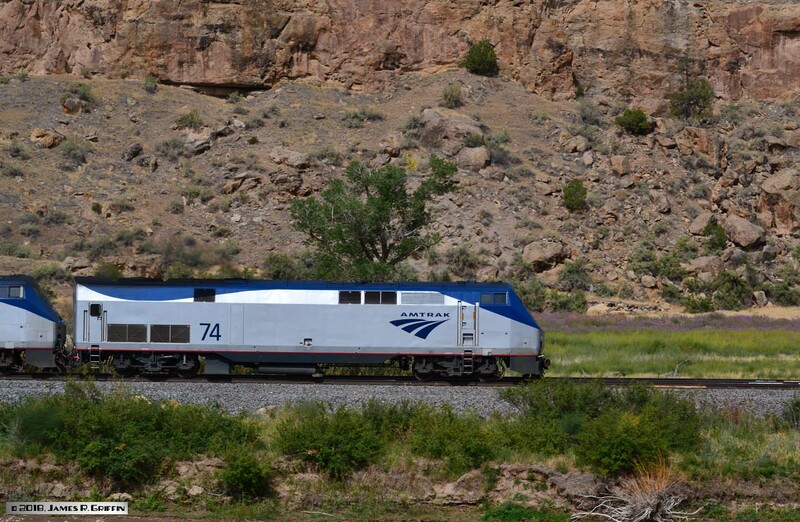 74 is on the point of train 6 in Debeque Canyon on 9/03/2018. Colorado River is in the foreground. No. 13 is the trailing unit on the above train. It’s approaching Tunnel Siding, where a BNSF local had stepped aside for the moment. couple of them during a trip to San Diego. No. 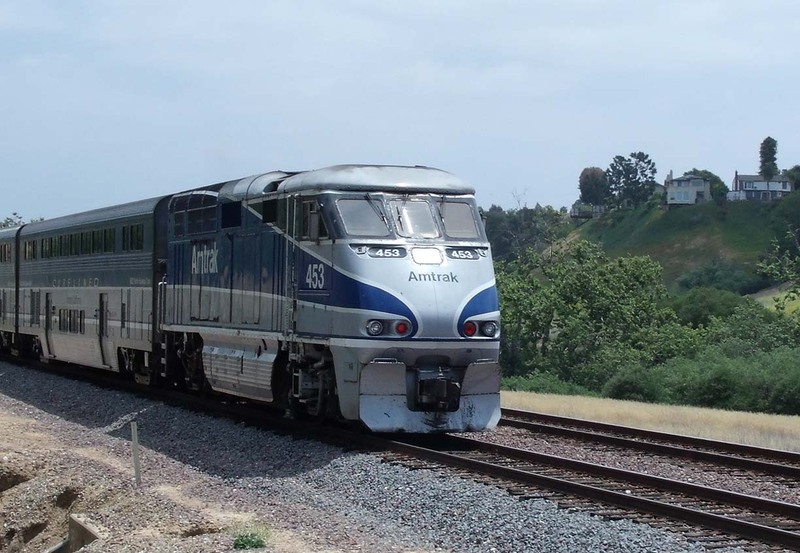 450 is leading a Surfliner train flying through through Rose Canyon in north San Diego. If you walk in this area, be aware these trains approach fast and quietly. Note it’s on the far track. No. 453 in nearly the same spot as the photo above, except that it’s pushing backwards up the valley. Note it’s on the near track. 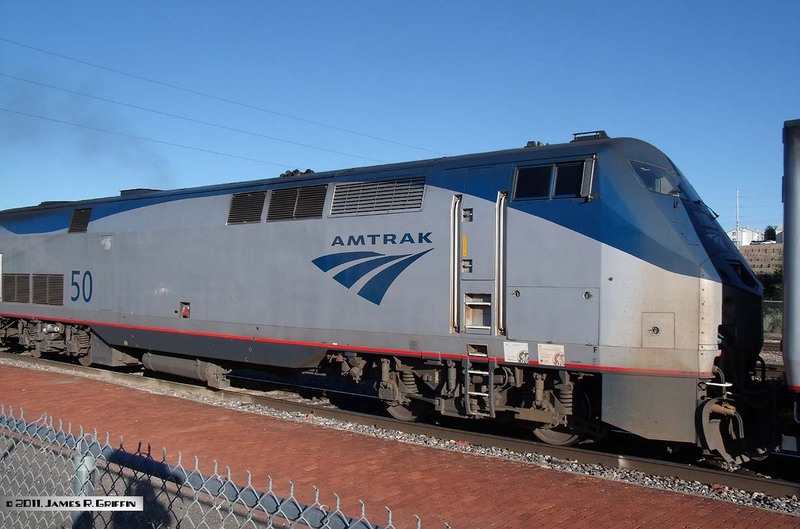 Given the history of Amtrak’s painting practices, we can no doubt expect new paint schemes to appear as time goes on, if budgets allow. 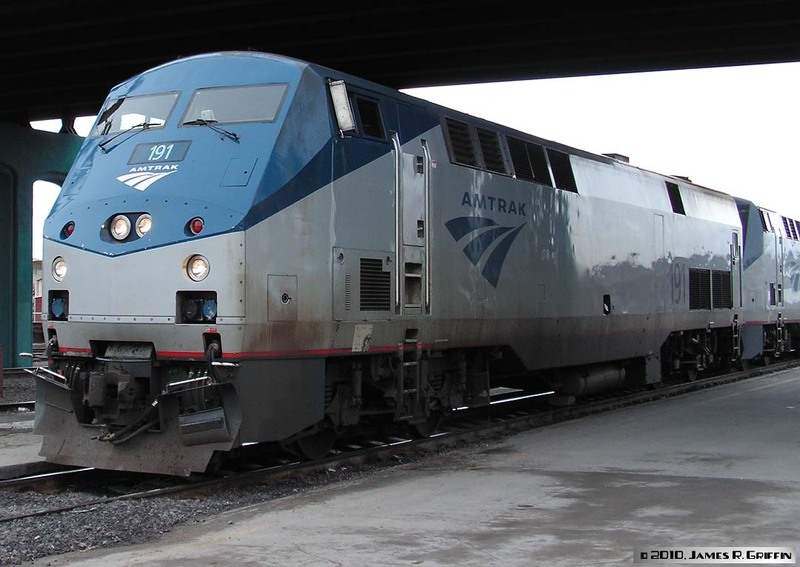 The locomotive fleet, however, is likely to remain stable for some years. You can be sure we’ll be watching for whatever might transpire. 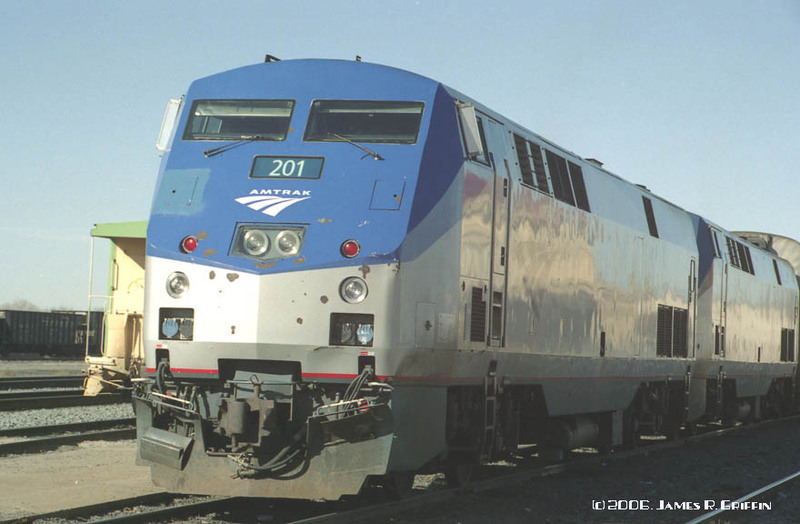 For more information on the Genesis series, visit 4rr.com — a very informative and comprehensive website dealing with this series of locomotive.